At first glance one sees no connection between Judaism and hockey. However, if you've been following the NHL's Florida Panthers incredible run to the playoffs this season, you've come to realize that the two can get along just fine. 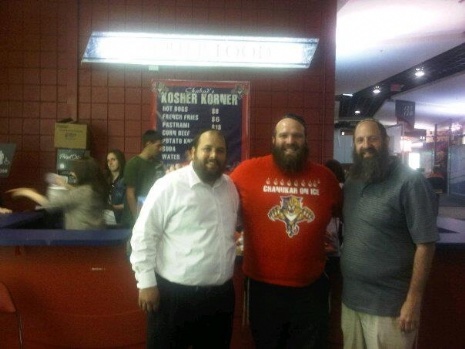 Mackie Feierstein, Director of Group Sales for the Florida Panthers contacted Chabad Rabbis Pinny Andrusier of SW Broward and Chaim Lipskar of Downtown who run Jewish Heritage Night with the Miami Heat and asked them to help organize a similar event at a Panthers game. 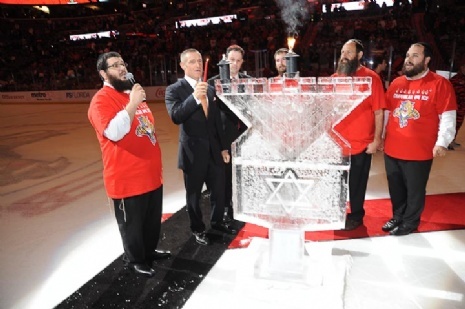 A partnership was formed and in December the Florida Panthers and Chabad teamed up to create a tremendously successful Chanukah on Ice. It was truly a spectacular event that featured thousands in attendance and the kindling of a beautifully sculpted ice menorah on center ice. Many of the men, women and children who showed up that night to watch the Cats take on the Phoenix Coyotes were attending their very first hockey game but soon realized how much family fun entertainment can be had at such an outing. It certainly helped that the Panthers played great hockey all season long, making a surprising run to the Southeast Division title and earning their first postseason berth in 12 years. 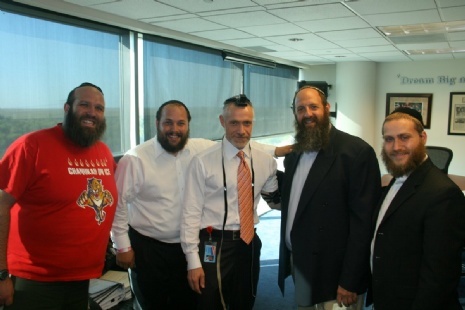 The success of Chanukah on Ice promised that the Panthers and Chabad would join forces in the future as well. Looking to upgrade the Kosher concession stand at BankAtlantic Center, Chabad was asked to take over the stand and make it more accommodating to kosher seeking fans. So yesterday, for game seven of the first round playoffs versus the New Jersey Devils, Chabad's Kosher Korner opened in Section 127 offering an expanded Glatt kosher menu which included hot dogs, knishes, pastrami and corn beef sandwiches on rye. In addition to the delicious menu, evening services took place between periods and many fans received from the rabbis in attendance quick lessons on kosher and other Mitzvot. 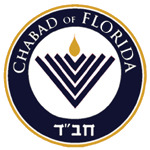 Most telling of the warm relationship formed between Chabad and the Panthers is when prior to game time Rabbi Pinny received a call from President and Chief Operating Officer of the Panthers, Michael Yormark asking him to come to his office to offer a special blessing and prayer for a victory which would have allowed the Cats to move ahead into the second round to face the Philadelphia Flyers. Rabbi Pinny joined by Rabbis Shuey Biston of Parkland, Adi Goodman of West Davie and Aryeh Schwartz of Cooper City visited Yormark and several Jewish members of his senior staff. A Mezuzah was placed on the door, Tefillin was put on and a special prayer was recited. Unfortunately, a bad bounce for the Panthers led to a goal by Devils' rookie Adam Henrique in the second overtime, eliminating the Panthers playoff run. Asked whether he's disappointed his prayer did not work, Rabbi Pinny responded. "G‑d always listens and I'm sure we received a very special blessing." "We asked for a win last night but perhaps after the victory the Panthers get swept in the second round and everyone's still disappointed. So G‑d took yesterday's blessing and is going to combine it with our future prayers so that instead of multiple second place finishes, a Stanley Cup Championship is in the very near future." Or as Shuey Biston suggested that perhaps there were some good rabbis in New Jersey praying for the Devils and G‑d doesn't take sides, especially since Florida already has the weather and the Heat. Panthers' star player Stephen Weiss who is not Jewish remained positive as well. "This is not where the hockey people predicted us to be at the start of the year," Weiss said. "We did some good things. We're obviously disappointed not being able to move on. It's been a fun year." "I'm sure people also wonder whether it's proper to beseech G‑d for something so trivial as a hockey victory?" Rabbi Pinny said. "Why not?" countered the rabbi. 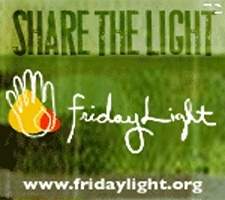 Our mission is to infuse G‑dliness, goodness and spirituality in everything we do and to the most mundane places on earth. To witness the president of a national sports franchise place a mezuzah on his door, don Tefillin and say the Shema hours before his team's biggest game in history plus see thousands of Jews flock during a playoff game for kosher food and a Minyan is what I believe is our mandate of making our surroundings a more G‑dly place and preparing the world for the coming of Moshiach." "Stay tuned for good things to come!" promised the rabbi.